A team of federal researchers directed by Interior Secretary Ryan Zinke to review Obama-era greater sage grouse conservation plans is recommending potentially fundamental changes, including moving away from a framework of prioritizing habitat protection and allowing states to develop "appropriate population objectives" for complying with the plans. The 52-page report, obtained today by E&E News and sent by the review team to Zinke on Friday, also recommends possibly removing or modifying the boundaries of so-called sagebrush focal areas (SFAs), which have been identified as the bird's most critical habitat and necessary to its survival. 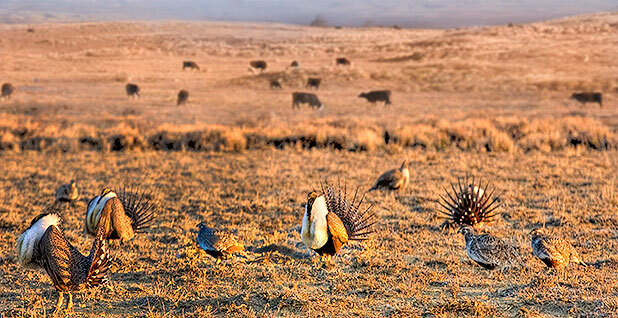 The Interior Department is expected to release the sage grouse team report as early as today. E&E News obtained a memorandum sent by Zinke on Friday to Deputy Interior Secretary David Bernhardt directing him "to ensure implementation of the recommendations" and to direct the Bureau of Land Management to work to "immediately begin implementing" the series of short- and long-term recommendations. "I'm thankful to all of the [Interior] team members as well as the bureau staff and the state partners who put in the hard work and time to develop this report," Zinke said in a statement. "I've directed Deputy Secretary David Bernhardt to begin implementation of the recommendations and to direct the Bureau of Land Management, in coordination with the U.S. Fish and Wildlife Service, the U.S. Geological Survey, and other offices in the Department, to immediately follow through on the short- and long-term recommendations," he added. The memo suggests BLM will explore making grouse population numbers, which are notoriously cyclical, the deciding factor over grouse health, as opposed to the federal plans that focus on protecting and restoring grouse habitat. Some of the short-term recommendations could be addressed by a BLM instruction memorandum, or IM, while longer-term changes, such as revising or removing the boundaries of the SFAs, would require a land-use plan amendment that could take years to complete. The report notes that "there is general consensus that all partners are committed to effective and durable measures to provide for the conservation of [sage grouse] to ensure there is no need to list [grouse] under the [Endangered Species Act] in the future." But changes are needed, the report says. Modifying or issuing "new policy on fluid mineral leasing and development" within sage grouse habitat. These include "investigating opportunities to provide additional waivers, modifications, and exceptions" for activities in priority habitat management areas, "through policy or potential plan amendments." Working with states with grouse habitat "to improve techniques and methods to allow the States to set appropriate population objectives" for compliance with federal plans. Investigating "the removal or modification" of SFAs "in certain states." Possibly removing "hard triggers" in the management plans that call for action to be taken when certain conditions exist that demonstrate "catastrophic population or habitat losses." Potentially increasing livestock grazing in grouse habitat by focusing on reducing "improper grazing." The recommendations, if adopted, would represent a stark departure from the Obama administration plans finalized by Interior in September 2015. Those documents amended 98 BLM and Forest Service land-use plans to incorporate strong, state-by-state conservation measures covering nearly 70 million acres in 10 Western states. The plans focused on protecting grouse habitat, particularly the most important habitat, such as grouse breeding grounds called leks. The federal plans were strong enough to convince the Fish and Wildlife Service that the bird does not warrant protection under the Endangered Species Act. Federal, state and local leaders across the West worked together with industry groups and environmentalists in a coordinated effort to avoid an ESA listing. Many fear such a listing for a bird that occupies an 11-state range would have grave economic impacts, interfering with the region's energy, livestock and agricultural sectors. Some fear abandoning the approach of the federal plans could lead the greater sage grouse to once again face the prospects of an ESA listing. But Republicans in Congress have attached riders in federal spending bills prohibiting FWS from reversing its 2015 decision not to list the grouse. Utah Sen. Mike Lee (R) has proposed an amendment to the fiscal 2018 National Defense Authorization Act that would forbid FWS from listing the species as endangered until at least 2027 (E&E Daily, Aug. 4). The revisions concern Nada Culver, senior director of agency policy and planning with the Wilderness Society. "The evaluation report and recommendations direct a reevaluation of habitat protection that could fundamentally undermine the structure and goals of these plans," Culver said in a statement. "The recommendations are a sideways attempt to abandon habitat protection in favor of unfettered oil and gas development and discredited, narrow tools like captive breeding and population targets. Gutting the structure of these plans puts the entire landscape at risk."